Ramkalawan knows the power of SAINT ANGE. He was always scared of the man, a popular and successful Ex-Minister who could easily defeat him. 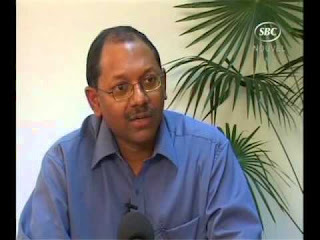 In the Seychelles National Assembly Ramkalawan is showing he is a fearful and paranoid Opposition Leader. He is obsessed and constantly reminding Seychelles that Alain St Ange is his adversary. He brings up the name St Ange at every opportunity. Today, in the Assembly he could not refrain himself from talking about Alain St Ange and the Etihad - Air Seychelles contract knowing full well that it was Joel Morgan who was responsible for the Transport Department and the said contract. He is making a mockery of himself because of his psychotic behaviour. Some are even saying on his toilet door he has a framed photo a of St Ange because it eases his constipation. Lets remind the people of Seychelles it was Ramkalawan who said to the Arabs and Etihad to pack up their bags and leave. This has contributed in the redundancy of 200 Seychellois by Air Seychelles. He is so gifted of making stupid statements like he did on Assumption only to backtrack when his supporters said no to the deal. The turncoat is suffering from severe verbal diarrhea. St Ange is in the Union and scares Ramkalawan. He has not even registered or a member of a Political Party. If and when he does Ramkalawan will be in tatters . He is playing the violin for St Ange to dance his way into politics and give him the trashing he needs. Posted by Seychelles Reality Today. ZWER BIHAR: THE CHIPS ARE DOWN!! !